Moonspell is a Portuguese gothic metal band from Brandoa, Lisbon. Formed in 1992, the group released their first EP Under the Moonspell in 1994, a year before the release of their first album Wolfheart. The band quickly gained status and became one of the most recognizable metal bands from Portugal. Moonspell reached the Portuguese top first with their album Sin/Pecado, and were, along with Metallica and Iron Maiden, the only metal band to reach the first place of the Portuguese charts after the release of their album, Memorial, in 2006. 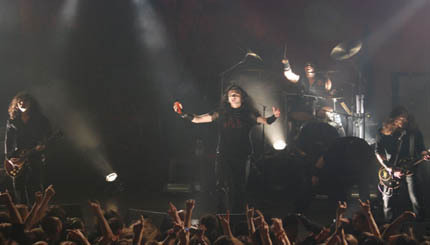 With Memorial, Moonspell also became the first Portuguese heavy metal band to have a record certified gold status. They are also very popular in Germany, where Memorial entered at 68th in the Top 100 Chart.